Gary Keller and Jay Papasan kicked off Mega Agent Camp with an update on the US and Canadian housing markets. Keller reminded the audience that agents are the local economist for their clients. It is imperative that when talking to buyers and sellers they make sure to have the most current information available to help clients understand the national picture and make the most informed decision possible. Here is a recap of Keller and Papasan's presentation. 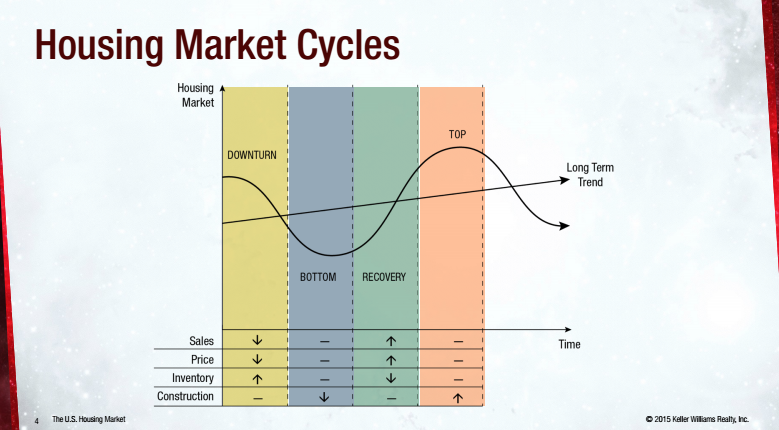 The housing market is broken into four cycles; Downturn, Bottom, Recovery and Top. Downturn – Characterized by falling sales and prices, rising inventory and new construction levels off. Bottom – Characterized by sales, prices and inventory leveling off. New construction falls. Recovery- Characterized by rising sales and prices, falling inventory and new construction leveling off. Top – Characterized by level sales, prices and inventory with rising new construction. Housing has always moved in cycles and we have had downturns before the financial crisis. For younger agents who have not experienced other cycles, they may think that every downturn looks like the last one; it's not the case. Home Sales have been strong this summer after a slow start to the year. A surge in home sales driven by low rates led to tighter inventory and price gains once again. The median home price for 2014 was $208,500. In June 2015, the median monthly home price was $236,400. We appear to be nearing the end of the bounce-back effect on home prices and are moving back to a long-term growth path. 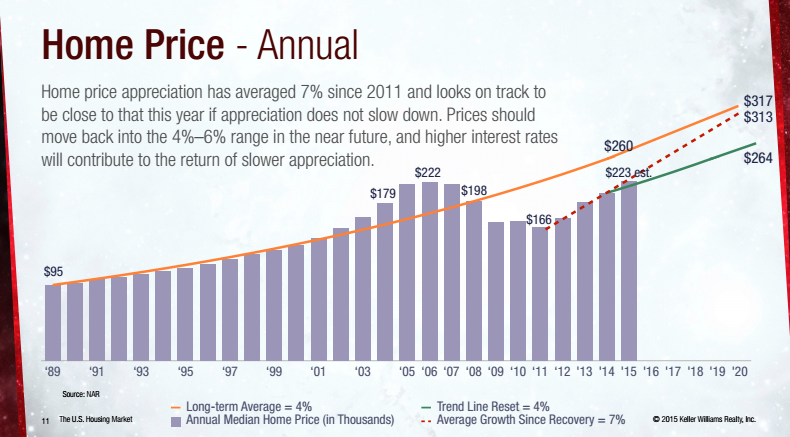 When interest rates rise, as they are expected to, we will likely see a slight slowdown in price growth. NAR's Housing Affordability Index measures whether a typical family can qualify for a mortgage on a typical home across the nation. The higher the index, the more affordable homes are. Affordability has been declining since January as prices continue to outpace wage growth. However, it remains historically high. This year we have seen movement back toward a seller’s market, spurred by people trying to take advantage of low rates before they increase. Currently, there are five months of supply. Because of continued low interest rates and the lack of any significant return in new construction, pressure on inventory has returned in many areas. Mortgage rates have been slowly rising since the beginning of the year as the Federal Reserve is still debating when to adjust. Expect to see continued upward pressure on rates in the medium term; however, there is currently a great deal of volatility in global markets putting downward pressure on rates. The largest contributing factor to the movement of rates in the near future will most likely be the timing of the Federal Reserve’s decision to make their first rate increase. 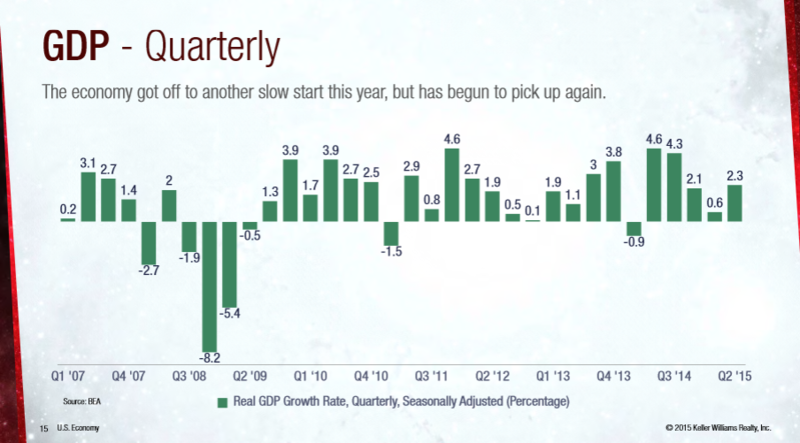 The economy got off to another slow start this year, but has begun to pick up again. The strong dollar and weakness in global markets is likely to keep growth for 2015 below 3 percent for another year. 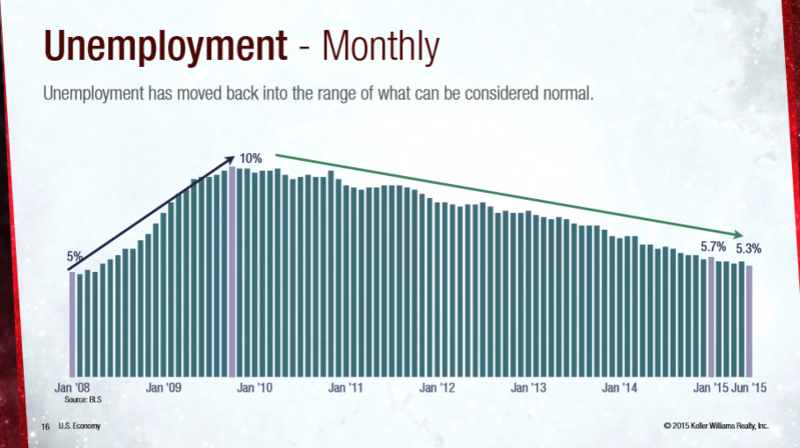 Unemployment has moved back into the range of what can be considered normal. Current rate is 5.3 percent, down from the beginning of the year when it was at 5.7 percent; last time the unemployment rate was at this level was June 2008. Factors that have impacted the unemployment rate include adding 2.9 million jobs over the last 12 months. Now that unemployment is considered stable. The focus is shifting to inflation and wage growth. 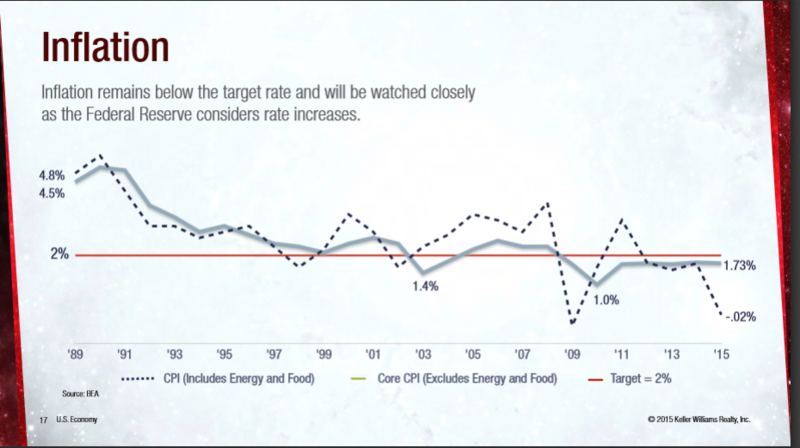 Inflation is below the Federal Reserve's two percent target, but getting closer to it. 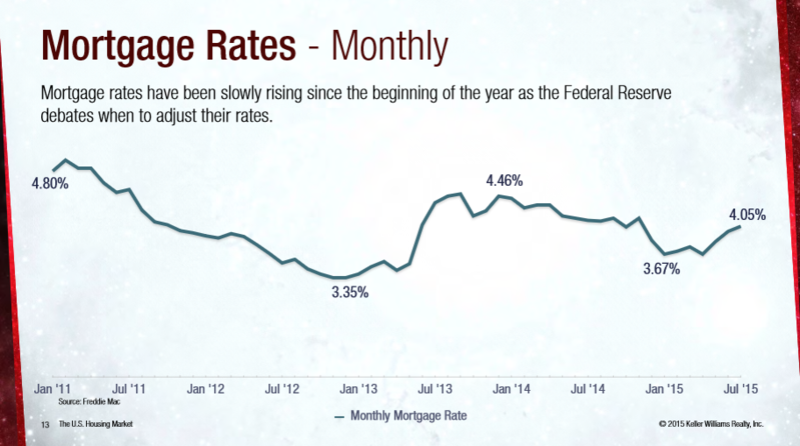 Affordability will continue to be a concern as we look at rate increases during the remainder of the year. 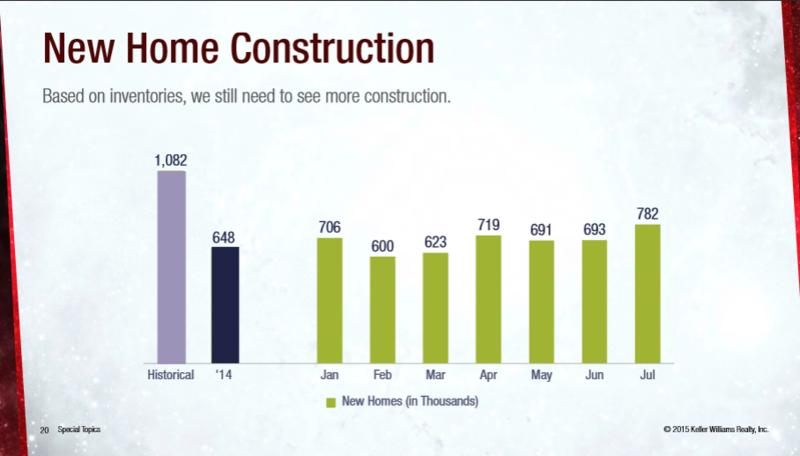 Based on current inventory levels, we still need to see more construction. July saw 782,000 new homes built. With affordability issues driving rents up, we continue to see significant multifamily construction. 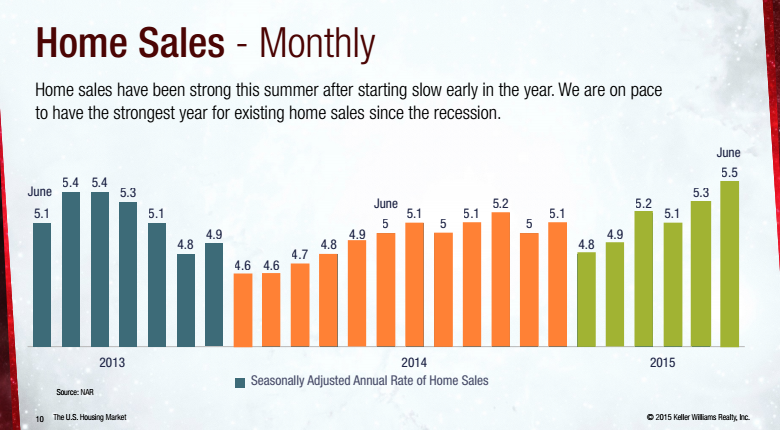 Home Sales: After a slowdown at the end of 2014, home sales have ticked up for most of 2015. Home Price: Prices in Canada have continued to increase, with the largest gains concentrated in Toronto and Vancouver. July 2015 average monthly home price was $438,000. 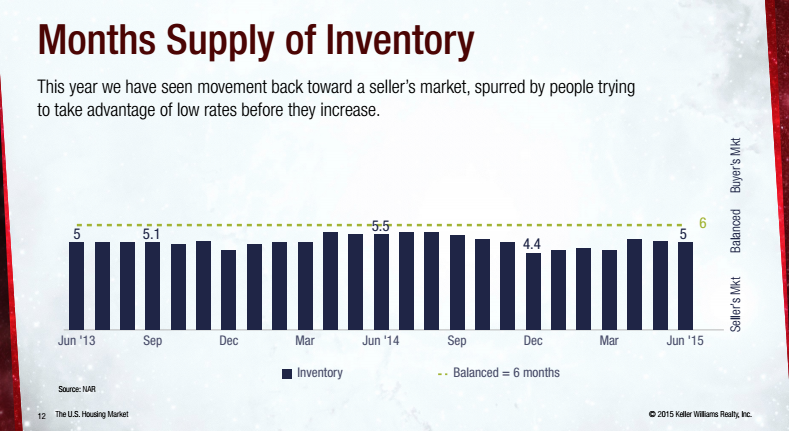 Inventory: Canadian inventory has remained in balanced territory throughout the year, but has been closer to a seller’s market than the previous year. Mortgage Rates: Rates have declined in Canada this year after the central bank cut rates early in January to counter the effects of falling oil prices. Completing your walk-through as soon as possible to avoid last-min changes that may require lender approval. In its efforts to protect consumers, the Consumer Financial Protection Bureau (CFPB) has begun aggressively targeting companies for allegedly using marketing service agreements (MSAs) as a disguise for kickbacks for referrals of mortgage and title business. MSAs have been common in the real estate industry as a way for one settlement service provider, such as a mortgage company, to hire another settlement service provider, such as a real estate broker, to perform general marketing services for a fixed fee that must be based on the services performed and not on the volume of business generated. The topic is addressed by Section 8 of the Real Estate Settlement Procedures Act (RESPA), which specifically prohibits kickbacks for referrals of mortgage and title business, but allows for MSAs as long as long as payment is fair market value for actual services performed. In the past, when the Department of Housing and Urban Development was responsible for enforcing RESPA, MSAs were not heavily scrutinized, but the CFPB has taken a much stronger stance against MSAs, reprimanding five companies over the past year with total fines and customer redresses in excess of $140 million. In response to this new regulatory environment, Wells Fargo and Prospect Mortgage announced in late July that they will no longer use MSAs, deeming the practice too risky given the recent actions by the CFPB.